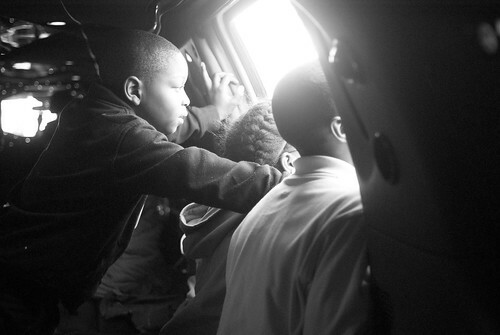 Cory Popp TTN Children look out the window of the limo on their way to the Franklin Institute. Tree House Books celebrates its third annual limo trip. What was an abandoned upholstery shop on West Susquehanna Avenue developed into Tree House Books. Since 2004, Tree House Books has been an asset to the North Central Philadelphia community. As an after school learning center and bookstore, its focus is to grow and sustain a community of readers, writers and thinkers in North Central Philadelphia. Feb. 1 marked its third annual limo trip where volunteers and a group of 19 kids were chauffeured to the Franklin Institute in two stretch limousines. In order to qualify for the trip, children were required to read 10 books at the start of the school year. Malique Prescott, 9, said he was thrilled that he would be going to Franklin Institute in a stretch limo. He said the goal of reading 10 books was easy for him. “This is my first time going [on the limo trip] and I want to see the giant heart,” Prescott said. With incentives like their annual limo trip, Tree House Books continues to foster the growth of children and get them excited and enthusiastic about reading. As a result, children are rewarded and encouraged to continue to strive academically. The limo trip is more than a reward for reaching their reading goals, but rather a way of showing the children that there is more to see beyond the corridors of their North Philadelphia community. Children are exposed to different Philadelphia neighborhoods and cultural enriching excursions. Not only does Tree House Books serve and address the educational needs of children, but also serves the community. Tree House Books places emphasis on building relationships with community members. Kierra Bussey can be reached at kierrajb@temple.edu. Danielle Mancinelli has become a star volunteer at Tree House Books. Forstater argues more people should volunteer for green causes. Local nonprofit continues to grow as part of the community.